One of the great things about a laptop is its ability to run from a battery. However, you should be aware of the power plans that are available to you. There may be times when you need to prolong the life of your battery and your power plan may become increasingly important. 1From the Desktop, press Win+I to open the Settings panel of the Charm bar and then click Control Panel. 2Click Hardware and Sound→Power Options. You should see Power Options displayed in the window. 3In the Power Options window that appears, click the radio button next to a plan to select it. Note that there might be a laptop manufacturer’s power plan among your selections; for a High Performance plan, you can click the arrow to the right of Show Additional Plans. 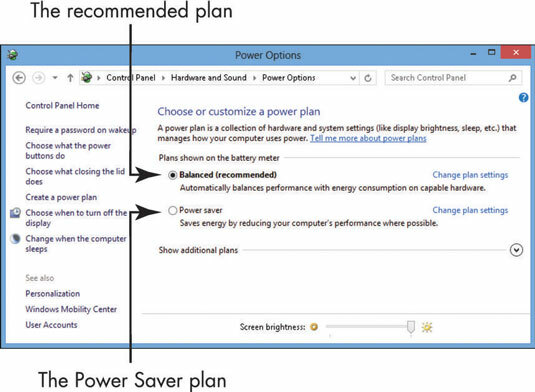 The Power Saver plan (this is listed in the Plans Shown on the Battery Meter section) causes your computer to go to sleep more frequently and dims the screen brightness. A higher-performance setting will never put the computer to sleep and will have a brighter screen setting. If you run your laptop on a battery frequently, the Power Saver plan is your best bet. 4Click the Close button to close the window. There are several options you can use for shutting down or putting your laptop to sleep.